Heat oven to 425°F. Line large cookie sheet with foil; lightly spray foil with cooking spray. In food processor, place coconut, bread crumbs, salt and ground red pepper; process 10 seconds to mix slightly. Place in pie pan or shallow dish. Pat shrimp dry with paper towels; place in medium bowl. In 1-quart saucepan, heat honey over low heat just until melted. Pour over shrimp; toss to coat. Roll shrimp in coconut mixture to coat; place in single layer on cookie sheet. In small serving bowl, mix sauce ingredients. 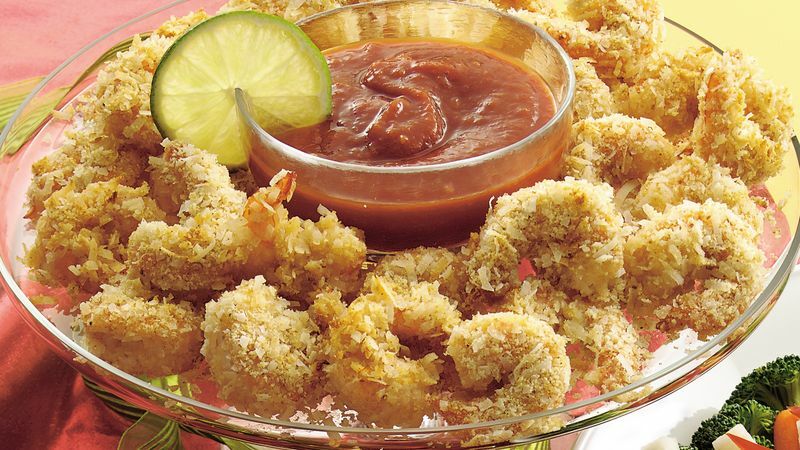 Arrange shrimp on serving platter; serve with sauce. To devein peeled shrimp, run a sharp knife down the back of the shrimp and lift the sandy-colored vein from the shrimp. Rinse to remove any excess vein.